“RE: RE: RE: RE: Needs input.” Gravity Flow helps organizations get rid of this nonsense, by extending Gravity Forms to make custom form-based workflows for administrative approval and user input processes. Gravity Flow is one of the coolest new plugins I’ve seen in quite some time. Invoices, purchase orders, job applications, and employee vacation requests are just a few potential applications for Gravity Flow, which makes form-centric approval, user input, and notification processes simple. “With Gravity Flow, you use the power of Gravity Forms to design your forms, and you use Gravity Flow to design your process using easy to use drag-and-drop tools,” the video states. The flows created in Gravity Flow can be customized to include all sorts of user-defined paths to request stakeholder feedback, get administrative approval, or fire off a notification that a certain step in the flow has been accomplished. It can even be integrated with other notification systems like Zapier. It’s not that common to see a WordPress plugin (especially an add-on plugin) that simultaneously targets a niche and serves it so extensively. Gravity Flow is built to extend the powerful Gravity Forms product, and it really takes it an extra mile. I see a lot of potential for Gravity Flow for intranets and other corporate environments with lots of stakeholders and traditionally clunky, email based workflows for approval of common tasks. I took Gravity Flow for a spin, because there is a handy demo site capability built in. For a plugin this complex, being able to test drive it is a really great feature. Most workflow tasks can take place either in the admin or on the front-end. Creating workflows feels a lot like adding regular notifications to Gravity Forms. 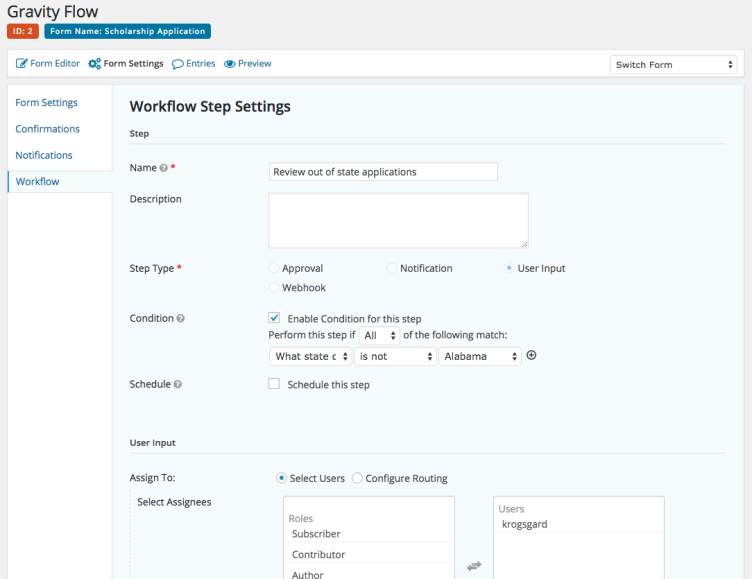 Workflows have many configuration and sending options. And each step can be sorted and arranged to follow a series of steps, and can even allow for delays (like for a scholarship review period, in my example). That’s the view for an administrator, but someone who is responsible for providing feedback or approval has a front-end view to directly interact with the workflow. 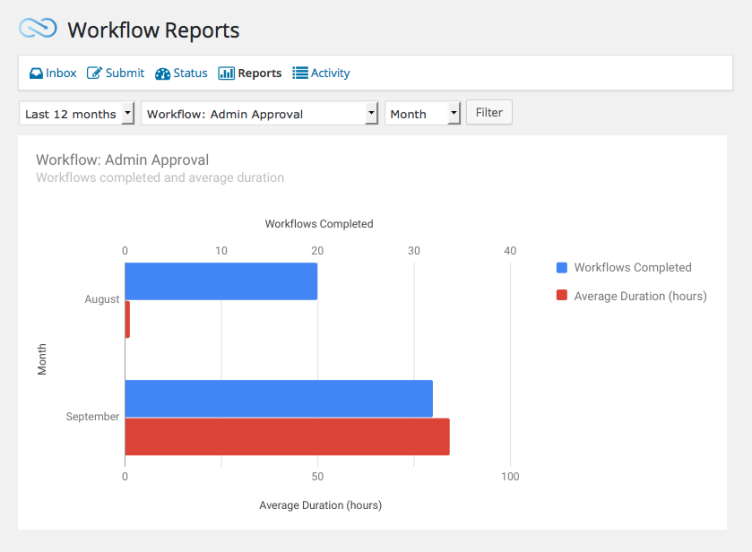 And administrators can see reports of activity for various workflows. This is a pretty simple overview of the plugin, and I’d recommend you check out the demo, or his full walkthrough examples. but this at least highlights some of the plugin’s power. One of the more interesting things about Gravity Flow is that Steven Henty made it. Steven actually works at Rocketgenius, the company behind Gravity Forms, and he is a developer of the main Gravity Forms product. I talked to Steven about why this isn’t a Gravity Forms official add-on, and what it’s like working on a side project for your own company’s product. 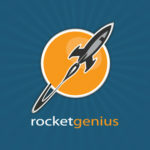 Rocketgenius has a lot of plans and loads of really exciting stuff in the pipeline so it was a question of priorities – Rocketgenius can’t possibly do absolutely everything at the same time. For me it’s a project that’s niche enough to be an interesting and profitable side project and yet not too time-consuming so I can continue to focus 100% on my day job. Steve did a great job with Gravity Flow, and I’m happy to see it out there. On his personal blog, he highlights use cases for the product, which are real world examples based on how his first 100 beta testers are using it. A few Rocketgenius employees have Gravity Forms focused side projects, which I think is really cool. 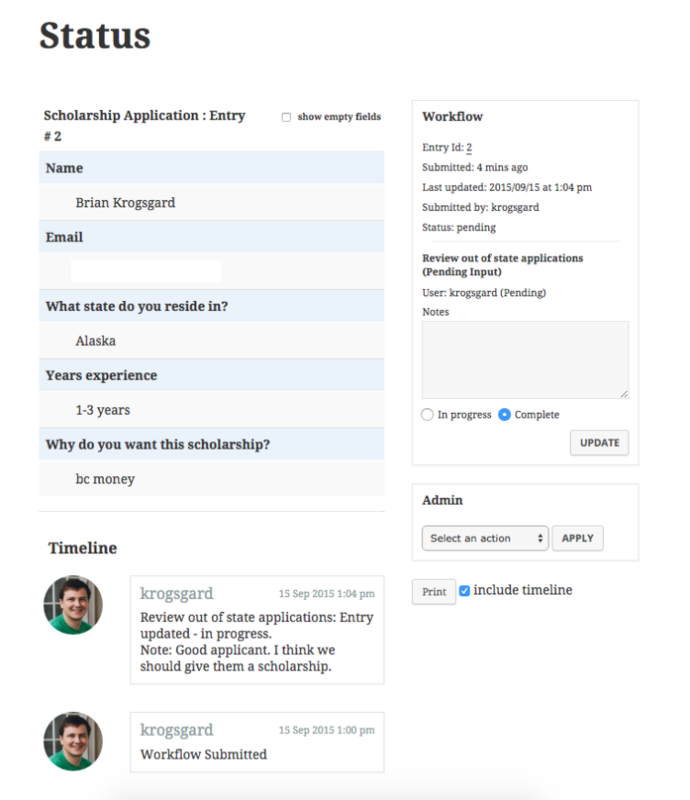 Another favorite of mine is David Smith’s Gravity Wiz, that adds functionality snippets, or “perks”, to Gravity Forms. The third-party ecosystem is doing well too; Gravity Plus and Gravity View are two healthy Gravity Forms focused businesses that come to mind, and I’m sure there are many more. The main plugin continues to dominate the WordPress forms space. Though it is commercial only, it powers hundreds of thousands of websites, and has dozens of official add-ons. Carl has told me many times he doesn’t even view most other WordPress forms plugins as competition (though newer entrants like Ninja Forms are doing quite well for themselves), as Gravity Forms aims to take marketshare away from complex hosted solutions like Wufoo, rather than gobble up the much larger but less demanding market that just wants simple contact forms. If you want to keep up with Gravity Flow, check out the website. And the project is on Github as well, as Steve is billing for support and automatic upgrades, which starts at €87 (around $100) per year. This looks like it could add a lot to the way that we process online orders and particularly to enquiries about custom-made jewellery items. I’m going to try it out.